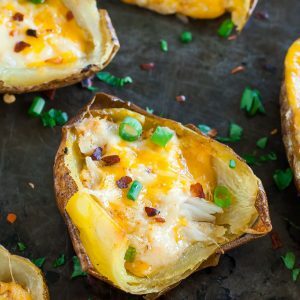 A restaurant copycat of my favorite seafood stuffed potato skins, these cheesy Cajun Crab Potato Skins are baked to crispy, melty perfection and are SO easy to make! I have a raging case of writer’s block today which may or may not have a teensy bit to do with the fact that I nearly gave myself a concussion goofing off on the monkey bars. It looks like today’s little ramble sesh is postponed for another day! You’re totally crushed aren’t you? Okay, okay… can you at least try to hide your excitement just a little? Or at least stop pumping your fist in the air. Gosh! Without further adieu, let’s get our recipe on! Rub freshly scrubbed potatoes with olive oil to crisp the skin. Place potatoes on a baking sheet and bake on center rack for 50-60 minutes or until tender on the inside and crispy on the outside. While your potatoes bake, combine crab, chopped green onion, cajun or old bay seasoning blend, garlic powder, and paprika in a medium bowl. For an extra kick you can add red pepper flakes or ground cayenne pepper to the mix. Stir in about 3/4 cup of your freshly grated gouda and cheddar, reserving the rest for topping. Once your potatoes are ready, allow them to cool, then slice each in half lengthwise. 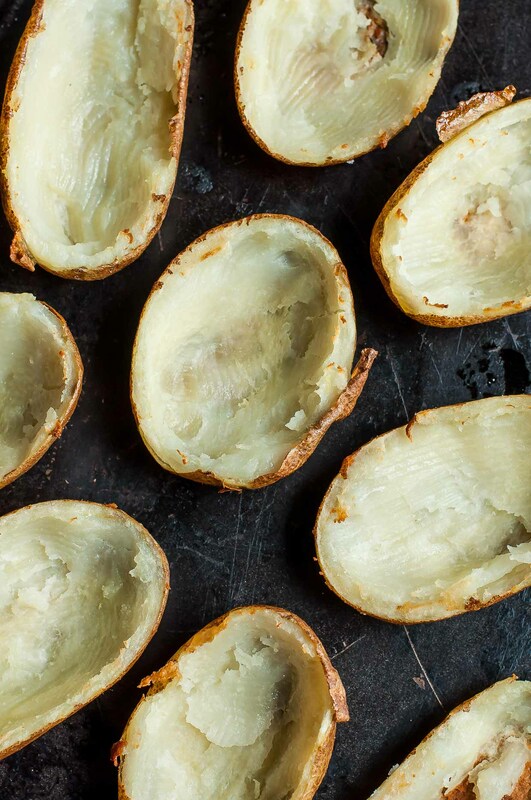 Scoop out the majority of each center and set aside, leaving a small portion of the potato around the edges to help them maintain their shape. I like to score an oval in the center using a knife before scooping to ensure pretty potato boats every time. Also if you have a grapefruit spoon or mellon baller handy, snag either for scooping. They're not necessary but are totally helpful! Wait! STAHHHHHP! Save the potato you just scooped out! It's a great swirled into creamy soups and you can even turn it into a mini loaded baked potato casserole or into mashed potatoes! The possibilities are endless. Brush the edges of each potato skin with olive oil and fill with the crab mixture. Top with the remaining cheese, a teeny pinch of red pepper flakes and a little extra paprika, to taste, and bake on the center rack for 15-20 minutes until they reach cheesy, crispy perfection. Garnish with chopped parsley [optional] and green onion and drizzle with sour cream or Greek yogurt! Want EXTRA crispy potato skins? You'll only need an extra step! Once you've hollowed out your potato skins, brush them with butter or oil and bake on a wire rack [like this one] skin side up for 10-15 minutes [flipping them at the halfway mark] before stuffing them and returning to the oven to melt the cheesy seafood filling. Easy peasy! Make them ahead of time with a few simple steps! With football season and holiday season all up in our business right now, chances are you’re going to want to make these to scarf at a party with your friends and family. Perfecto! You can prep the skins and the fillings ahead of time for uber easy party prep! Bake your potatoes up to 3 days in advance! You can even go the extra mile and halve your spuds, scoop the flesh, then store in an airtight container or foil in the refrigerator. Feel like prepping the filling too? You totally can! Mix the crab, cheeses, and seasoning in an airtight container and pop that in the fridge too. Like the spuds, you can do this a few days in advance, though it’s so so so fast that if you leave it for the day of, it’ll only take a few minutes to toss together. 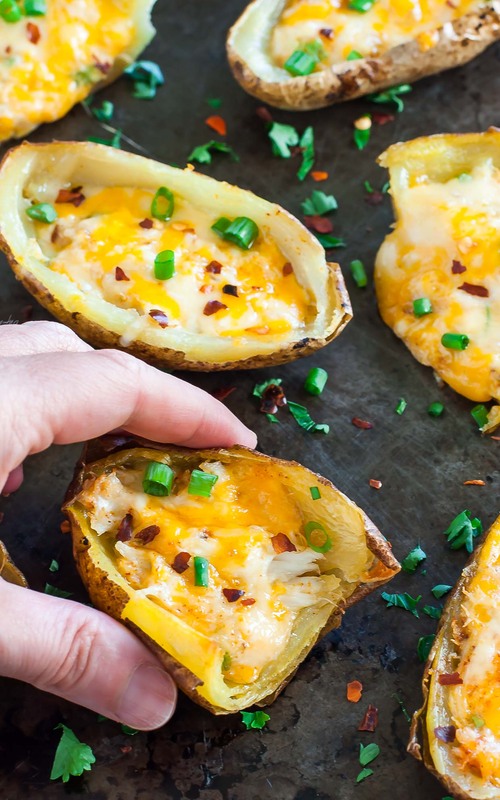 As an added bonus, you can even keep your prepped potato skins in the freezer for over a month. Re-heat them just like you would french fries, only smother them with all your favorite potato skin toppings. Huzzah! Dare I say that they rivaled the restaurant version? They totally beat the pants off the original! I almost didn’t have enough to photograph because I kept stealing them off the baking sheet while arranging them for a photo. One for the tray; one for my face! Eat. Snap. Repeat. I’m all about deliciously easy, fuss-free appetizers and these tasty spuds totally fit the bill! Hungry for more? Try my Loaded Spinach Artichoke Potato Skins next! 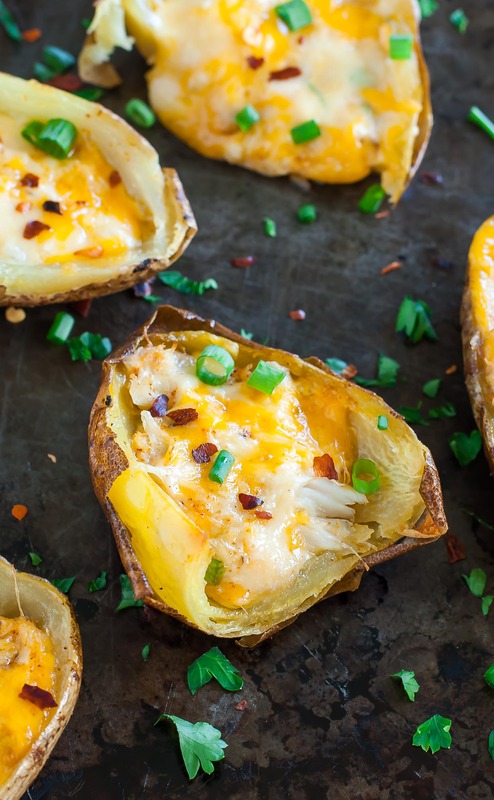 If you get a chance to try these cajun crab potato skins, let me know! You can leave me a comment here (LOVE checking those daily!) or tag @PEASandCRAYONS on Instagram so I can happy dance over your creations. I can’t wait to see what you whip up! Omg. That oozing cheese. Amazing. Love potato skins!